That morning, I woke up early to catch the hype of Car Free Day in Surakarta City… walked about 20 minutes from hotel to Slamet Riyadi Street and suddenly found many interesting things, I thought I will only find people with bikes and sport shoes, and street foods, but I the crowd proof I was wrong..
First, all the street foods along Slamet Riyadi Street will make you confused like I was.. It was like I want to ate them all.. hehehehhee.. I chose soto as starter, and it was quite right for breezy morning, the soup comfort my tummy. 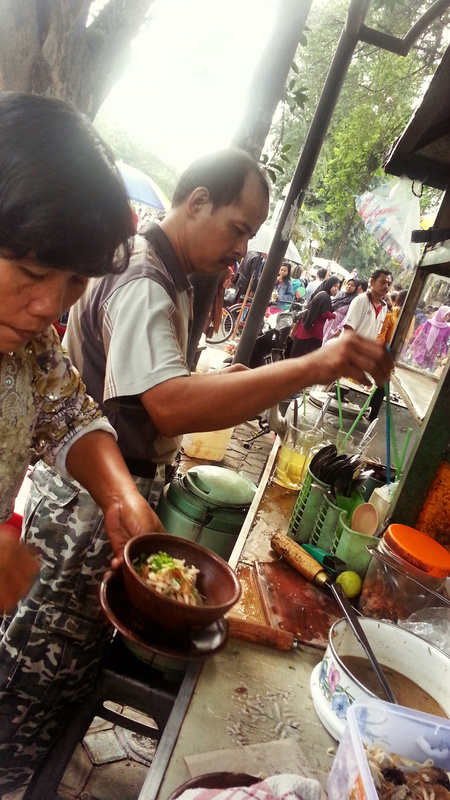 After breakfast, I walked along Slamet Riyadi Street from east to west… umm.. with tahu petis in my hand.. I tell you, this tahu petis was one of the best, tahu petis made from deep fried tofu with petis paste in the middle. Do not judge by how it looks, the paste may black but it taste very good..
You also can check your blood pressure, blood sugar and uric acid! No kidding, I found a girl who offer that test and I took the tests for IDR 6.000 each.. and she also gave advices for her customer related to blood pressure, blood sugar and uric acid, for free.. great isn’t it? Surakartans were so lucky to have a weekly event which give them a freedom to make any positive activities, to bond with family, pets, friends and make more friends. This entry was posted on February 23, 2015 by Utami Isharyani in Leisure, Solo, Surakarta, Travel To and tagged #CarFreeDay, #Events, #SoloCity, #SouthEastAsia, #Sunday, #Surakarta, centraljava, indonesia.